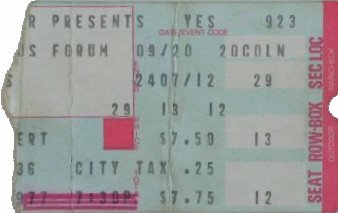 This was my first experience of Yes live, and only the third rock concert I'd ever attended. We were seated near the front, just off the performers' right side of the stage, and Steve Howe was just a few feet in front of us. Doesn't seem at all like 30 years ago; a very memorable and fulfilling experience for me, and surely a defining moment in my now 35-year admiration for Yes and its music. I once acquired a bootleg recording of this show and regret that I have lost track of it over the years. This was a great concert. 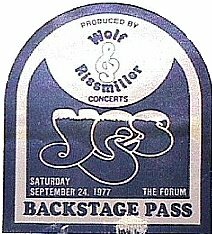 I had second row seats at this show. They are, YES, all amazing musicians. Thanks for putting this site together it is awesome. Donavan was great. Does anyone remember the song intergalactic laxative? I went to the 91 show in San Diego. I didn't have great seats but what a performance. That was the beginning of a disability that put me in a wheel chair. The band gave gifts to all those that were disabled because they showed up. Thank you very much. I see tonight [???]. Here's a song for you. Thank you. I'd like to carry on with a song from our new album 'Going For The One', Okay? [???] This is a song that came from a wonderful, beautiful morning. You know one of those mornings that..uh [???]. A song called 'Wondrous Stories'. Here in LA. Sunshine comes each day. In LA, LA, LA, LA, LA, LA, LA, LA, LA. Southern California. Here in LA. Sun shines everyday. There's some wonderful people here. Here's a song we recorded a long time ago. It's called 'And You And I'. Woo! Here's a new song we put together..uh on our new album and..uh [???] just a little bit, just a little bit of rock 'n roll.